The German language and myself have had a love/hate relationship since the moment I set foot in this country. I want to learn the language, but the language is using all of its powers of resistance not to enter into and stay in my brain. This struggle is coming to a 3-year mark soon. Some of you may remember my post ‘Ich spreche nicht Deutsche’ from back in April 2012. It has been one of my most popular posts to date which soothes me in that I am not the only German language idiot out there. Things were pretty bad back then, but how have they progressed over time? I still can’t speak German very well. No surprises there. I took German classes to get myself up to the B1 level but decided to take a break from going to language school at the start of the year. My Lord has it been hard to get back into things. So many promises made to myself have been broken – getting a tandem partner, speaking German with friends, self-learning from books. Such laziness and lack of motivation on my part has made it that I cannot blame anybody else for my lack of skills. The only thing I actually do on a regular basis is play the Duolingo app which I highly recommend. This is the point in the blog post where I would usually ask for tips in how to learn a language. However, this is not what I need now. Instead, I would be forever grateful if somebody could give me tips on how to motivate myself and to shake away my insecurities in speaking in front of other. Hit the comments section please! I have these phases when I crave learning, and desperately need fodder for my brain, but then the end of the working day comes around and all I want to do is relax with friends and wine. Motivation isn’t my strong point! But I have had really good experiences with tandems – a regular meeting forces you to meet them. And as for shaking insecurities, I don’t think I’ll ever enjoy speaking German on the phone. It’s unnatural, I’m terrified of not understanding and I’m pretty robotic…and the only thing that calms me down is that I know I’m not the only one! Thanks for the comment! I feel exactly how you just described. I have all these good intentions but a 40-hour working week does nothing to encourage them. Glad to hear that you had good experience with tandems. Lots of people have recommended it so I should really get my act together and give it a try. Ich speile federbal one of my key phrases from my German junior cert!! I play Badminton. Great conversation starter but not so good if I get lost in Berlin in May!! I am sure you won’t get lost! And if you do, the worst you will find yourself is involved in a game of badminton! The best tip from my German friends was to stop worrying about the grammar and just get the words out. They’re right – I’m a rules person, so I like to get the grammar right, but I’m really bad at learning vocabulary. But it really did help me. Are you living in or often visiting Germany? 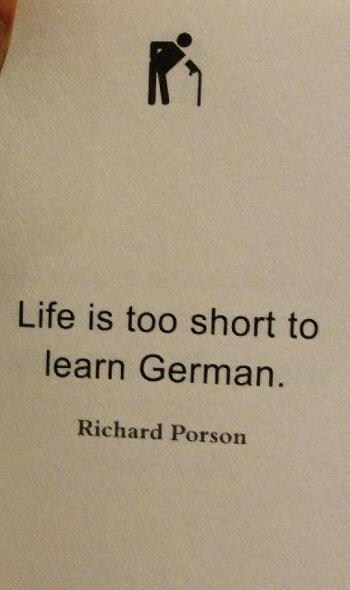 I think it’s the only way to really be successful in learning another language.Viel Gluck! Oh the grammar is a nightmare so I think I should certainly take your advice on board! I have to admit with shame in my eyes that I have lived in Berlin for 3 years. I speak a bit but not as much as I would like. More effort has to be put in soon me thinks!